[00:30] <SunUNIX> hey im getting this error message on oracle solaris 11.1 when compiling ffmpeg install: ffmpeg.1 was not found anywhere! 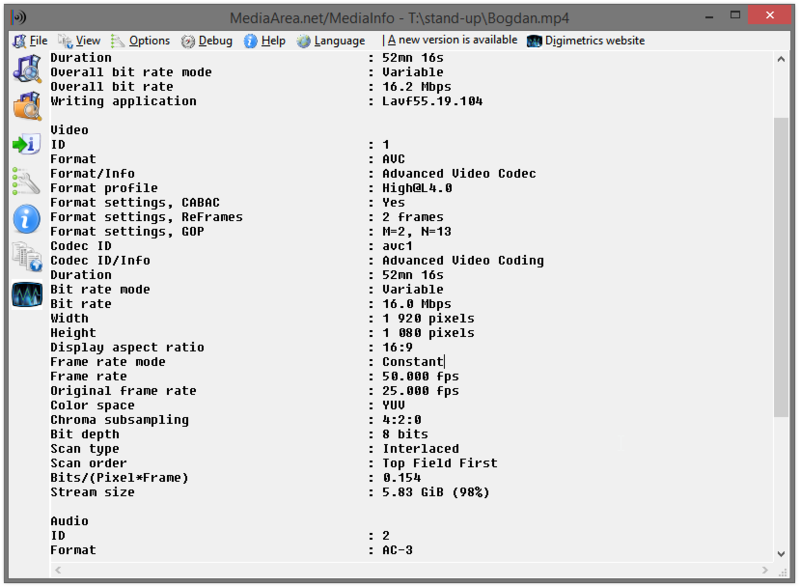 [07:06] <corajo> I just want the best libx264 settings for encoding a video consisting of an audio track and a single image. [07:06] <corajo> I already put -r 1, so that outputs only 1fps. [07:08] <corajo> Me video dont really have any movements or chainging images. [09:48] <termos> is there a way to get libpostproc without --enable-gpl? Not all of the post processing filters are GPL and I just want to use the non-gpl ones. Any ideas? [10:47] <allengreen> how to remove audio from mp4 file? [10:53] <allengreen> how to remove audio from mp4 file and don't reset the pts? [11:30] <luc4> Hello! Maybe someone here knows: are decoders supposed to always return the exact same output? Like an h264 decoder. Or I should expect slightly different output? [11:41] <luc4> brontosaurusrex: so, the aspect of some hardware h264 decoder should provide frames perfectly identical to those provided by ffmpeg? [11:42] <luc4> brontosaurusrex: I thought that even jpeg output was not always perfectly identical... ok, it seems I was wrong... thanks! [12:14] <kevmitch> will ffmpeg link to gnutls28? [12:30] <znf> How would I deinterlace a 50i video to 25p? [12:31] <brontosaurusrex> znf, thats 100 sub-pictures/s ? [12:31] <znf> I think that's 25? [12:37] <znf> what am I doing wrong? [12:40] <jonascj> can you call ffmpeg a framegrapper when it captures video from a camera? [12:41] <jonascj> or is it video capture? [12:41] <brontosaurusrex> znf, and the speed of the output is normal? [12:42] <relaxed> are you sure it's interlaced? [12:44] <relaxed> tsmuxer is a good tool for that. [18:04] <Lokie> googled and seems the culprit is fontconfig? running 2.9.0 and seems anything before 2.10.93 won't really behave. is that correct? [22:41] <Orbixx> How do I tell ffmpeg what codec to expect for the input file? [22:50] <Lokie> ignore? anyone had that warning and found how to correct it? [22:52] <c_14> According to that bug some program is linked to a different (presumably older) version of fontconfig. [22:53] <Lokie> so it's ffmpegs fault? [22:56] <c_14> Which static build did you use? [22:56] <sacarasc> Lokie: A static build means that all the libraries are compiled in. If you upgraded a library outside of the static bundle, it doesn't upgrade within it. [22:56] <c_14> And the Fontconfig error is caused during ffmpeg execution? [22:58] <c_14> If the fontconfig version that the static build was compiled with is older than the system one, it could be that the static fontconfig tries parsing the system fontconfig settings and fails because the syntax is different. [23:06] <Flobu> hey anyone here to help me with building ffmepg with vs2013? [23:17] <codepython777> is there  a way to tell ffmpeg, Given an input movie, cut from start time, till end time- and stitch the remaining movie to one piece? [23:18] <codepython777> so something like ffmpeg -i x.mov -st 00:00:05 -et 00:00:10 out.mov - will create out.mov which is exactly like x.mov but 5 seconds deleted from x.mov ? [23:18] <klaxa> you mean -ss and -to? [23:19] <klaxa> well... use two steps? [23:19] <codepython777> klaxa: how do i concatenate the pieces? [23:22] <codepython777> klaxa: ./ffmpeg/bin/ffmpeg.exe -i ./DSC_1234.MOV -ss 00:00:03 cut.mov - this takes a lot of time. Any ideas how i can speed this up? [23:22] <codepython777> I was hoping cutting and pasting /merging should be fast. It seems its reencoding. [23:29] <klaxa> well define "long"
[23:37] <codepython777> Running the script to do all of the cuts and merges. Lets hope that works.